A large number of students, including several females, have said they would like a lightweight, sturdy, and comfortable holster that is easy and quick to put on and take off, doesn’t “break the bank” in cost, that could be worn casually without a belt, and would work with more than one model handgun. The females asked about a holster that would fit the female anatomy, especially their short-waist, as well as allow them to carry personal items, e.g. knife, small flashlight, extra mag, lipstick, etc. Well, there is a holster that I was asked to review that could possibly meet these criteria. So, I want to examine its features and try it myself for a few days to see if it meets the criteria for this guy. Also, I asked my wife to wear it for awhile and give me her opinions. She was quick to specify it must be easily and effectively worn with capri pants, sweatpants, and with gym or exercise shorts, without a belt. She and other instructors who are female tell me that ladies do not wear belts as frequently as the guys and most are short waisted with their top half being smaller than their bottom half. When I think about it, I guess there is a difference. Shooters also want a well-made holster that has adequate support, is fitted to their particular gun, is versatile, and can accommodate some of their other handguns as well. This review is about the Brave Response Holster. So I want to give you the factors I use for assessing holsters in general and apply them to my review and evaluation of the Brave Response Holster. I might add that I have never used this holster before, nor have any of the students or my wife who gave feedback on the holster. I will give you my criteria, my ideas which includes feedback from some students, and my recommendation to help you with your decision, using my standard review process. I certainly do not have all the answers for holsters and what works for me or a few students may not work for you, especially given the short trial period of a few days. Selecting a holster is a very personal thing and there are a lot of individual preferences and factors that are involved. So, selecting a holster is your personal decision according to YOUR factors and priorities. QUALITY MADE: What is the material and is the holster constructed with quality? Is the stitching strong and is it sturdy and does it look good. Will it stand up to your particular demands, wear and tear, and is it appropriate for your use without impairing performance and mechanical function? What is the thickness or composition of the material? Is it durable for your use? Are the (as applicable) straps, velcros, rivets, clips, grommets, snaps, buckles, rings, backing material, metal parts strong, rustproof, and quality made? Does it (if appropriate) have a sweat shield or skin guard of some type? Is it a reputable company? What type of warranty or guarantee does it have? Consider the holster’s weight and bulk. 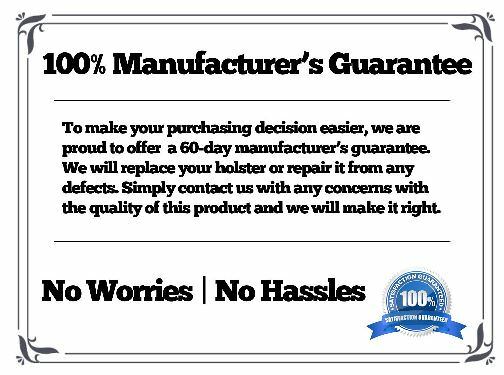 Is the holster designed to minimize the amount of material needed to hold and protect the gun, thus reducing weight and bulk of the holster. ALL DAY COMFORT: How comfortable is this holster style during each of the different physical positions; walking, bending, sitting, standing, and twisting? Can you wear it while driving? Can you wear it for the entire day comfortably and not even know that you are wearing it? CONCEALMENT: Does the holster perform as required for its effective purpose? (This holster will be used for concealed carry.) How well does the holster hide the handgun during every-day body motions, like walking, bending, sitting, standing, twisting, reaching, etc.? Imagine wearing the holster during these different movements. Is there a cant and angle adjustment for the holster, to provide better concealment and comfort? ADAPTABILITY & FIT: Can this holster be used for different handguns… or with a Laser sight or light? How versatile is it? The safety features of a holster usually require that the holster be engineered and designed for each specific manufacture and model of handgun. Does this holster do that (as appropriate) while being adaptable to other similar-sized guns? Are there modifications available, options, or additions that adapt to other handguns? What are the approximate costs of these adaptations, if any? Is the shooter’s gun(s) properly fitted for this holster? Does the handgun insert so deep in the holster that the gun grips cannot be properly accessed? Does the gun ride too high in the holster to meet your needs? Does the gun jam so tight into the holster that it takes two hands to draw it or can you draw the gun easily with one hand? Can you re-holster the gun easily and safely? PRICE: What is its total price relative to other options, especially very similar ones, available now? Do you get any special features, options, warranties, guarantees, repair service, or additions that are worth something? Can you return it without any questions and within what time period? Will they repair or replace it for free? Do you get what you pay for? prevent forward or rearward movement of the hammer? EASE OF REHOLSTERING & ACCESS: Can you reach your handgun quickly in an emergency or while sitting in your vehicle? A rigid holster will allow a handgun to be returned to it using only one hand, while a flexible one may collapse after the gun is drawn, requiring the use of both hands to reholster. Is the mouth of the holster sufficiently rigid or reinforced to allow easy re-holster? How easy is it to access your weapon and use the holster while walking, bending, sitting, standing, twisting, etc.? EASE OF PUTTING ON & TAKING OFF: Can you simply and easily put the holster on and take it off. 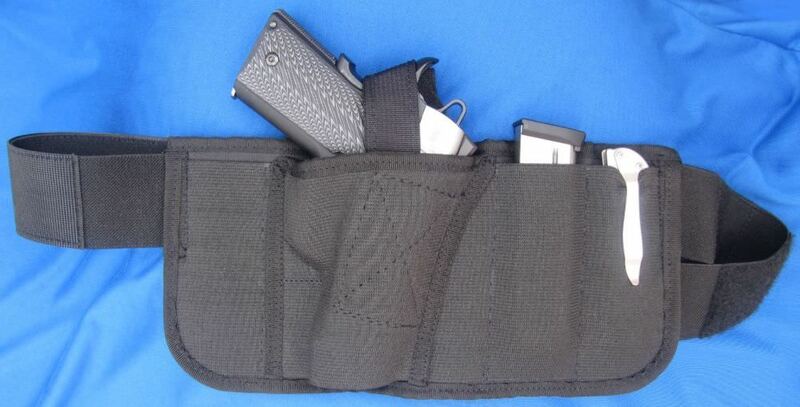 Consider if you will be putting this holster on and taking it off throughout the day and under what conditions. Must it be removed for taking care of personal needs in public restrooms? If so, can you do it safely and easily? ACCOMMODATIONS: Can you wear both open or closed cover garments with the holster? Can you effectively use the holster while wearing shorts, capris, sweatpants, or clothing without a belt, as applicable? Do you have to wear special clothing or make accommodations in dress or draw when wearing and using this holster? Are a special cover vest, extra efforts, or larger trousers required to hide and use the holster and handgun? Any extras (as appropriate), like a spare mag pouch or room for a knife, etc. RETENTION: Does the holster retain the handgun adequately? Is the holster snug when fitted on a gun belt (as appropriate) or as designed for a consistent and fast draw and to reduce draw resistance. Is the gun secure in the holster? A holster designed with solid retention will also help prevent a gun from being removed from the holster by another. To simplify, I will list my 10 Criteria and then beside each factor give my rating and brief comments. My final buy or not buy Recommendation will then be given at the end. Remember, just my opinions. Here we go. As the website says this holster is made of “heavy duty breathable canvas, lined with cotton poly next to your skin.” It is a thin holster, but for the short time I used it, I believe the workmanship will help it last and be durable. Its thinness helps it be light for comfortable daily wear. Since it is lightweight, it does not feel cumbersome. I believe that this holster will stand up to constant wear pretty good. I wore it regularly for 5 days during my everyday routine activities. It was very comfortable and I did not realize it was there. It was small and very light by design which allowed it to ride smoothly with my motions or change in body position. I found it to be more than satisfactory when bending over, walking, sitting, crawling under things, lifting, and exercising. My wife wore it with her casual pants and jeans without a belt and she said it was very comfortable and secure. This holster molded easily to my handguns after just a few hours and helped to have a small footprint for concealing them. It fit and hid my Springfield EMP, my Sig 320 Subcompact, my Ruger SR9C, my Smith & Wesson M&P9C, and my Springfield 1911 Range Officer 5″ barrel when I wore them with open cover garments, as well as when I wore a closed cover garment with them. I did notice some slight variations in fit with the many guns I tried, so one size does not fit ALL guns exactly, but adequately. Often, I wore just a safari camp or guayabera shirt and my gun was not detectable at all with this holster. I wore it in various positions: IWB, OWB, and appendix carry and it was concealable with these variations. This canvas holster is very moldable and it is convenient that you can have this one holster to adequately fit 5 or 6 of your guns. All 6 of my trade-off carry guns fit in the holster adequately, but there were some minor differences in fit. Some of my 4 inch barreled-guns stuck up higher than others. Others stuck out of the bottom, but it was workable. However, I do like the versatility and flexibility. It will not fit guns that have anything attached to the rail. The $70. price of this holster is at the upper limits of comparable holsters, which range from about $20 to $75. It certainly is affordable, in general, but not a great price. Other leather, kydex, nylon, elastic and bellyband holsters are available for that price or somewhat less. I found a quality bellyband for less than $20. But recognize that it is difficult to compare it with other holsters given its canvas material, construction, and features. Since this is the only holster this company produces and its mission is primarily firearms training, over time their holster overhead and costs may come down and price adjustment made. Personal preferences, features desired, quality construction, and meeting your purpose are important factors here. There is a standard flat-rate $5 U.S. shipping. This holster provided more than adequate safety protection for the handgun and nearby people when drawing and removing the gun in and out of the holster. This holster was designed appropriately to allow you to grasp your gun sufficiently for safety. The trigger was completely covered. I was able to keep my trigger finger straight along the outside of the holster easily and to grip the gun quickly and correctly to prevent negligent discharges, accidental trigger movement, and without accidental disengagement of the manual safety or hammer movement. The thumb snap was cumbersome to easily and quickly snap off safely when drawing, but practice with this will help. It was easy to reach and draw my handgun quickly from this holster, but re-holstering it without looking or using only one hand was not easy. The mouth of the holster is not designed to be rigid and it caves in or bends at the top which affects ease of re-holstering. This could be a safety issue, but after use of the gun in an encounter, there should be plenty of time to carefully re-holster the gun into this holster. Probably two hands should be carefully used to reholster for this holster, recognizing that most accidents occur when reholstering. The mouth of the holster could have been more rigid and an added mouth-reinforcement material would really have helped a lot. Of course, this would add to its cost. My wife tried the holster and she also had trouble re-holstering her gun when she wore her capri pants without a belt. Also, the thumb snap slowed her and my access time for drawing. We did not have problems physically drawing from the holster. This was very easy to do. Dealing with the straps and velcro closures were not problems at all. I really like how quickly and easily you can put the holster on and take it off. Going to the post office and quickly slipping off the holster for storage was very easy. Putting it on and off in a stressful encounter is also probably very easy to do. Putting it on and off was just as easy as my belt and paddle holsters. 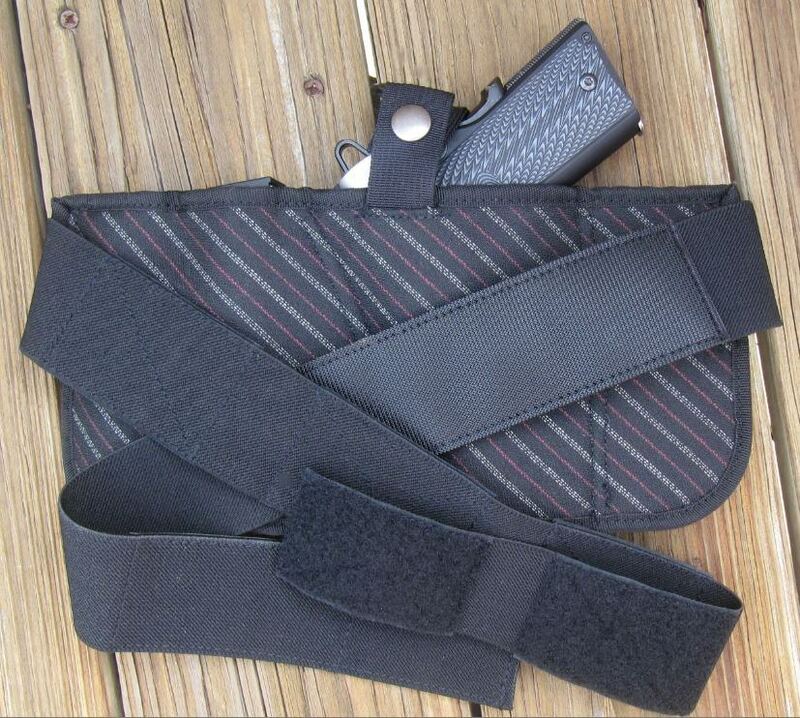 You can wear both open and closed cover garments with this holster and not have a concealment or operational problem. There is no design problem that would prevent using any type of coat, shirt, sweater, zippered jacket, or any garment with this holster. No special clothing or extra accommodations in dress are needed. Remember though to snap off the thumb snap when drawing. Practice this so it can be done smoothly and safely. My wife likes that she can wear the holster comfortably on various locations of her body with her sweatpants and capris without a belt and easily adjust it. There are both right and left hand options and there are 3 extra mag pouches. The holster did retain my handguns adequately? The pressure of my body pushing against the holster helped tightened up the retention and made it more secure in the holster when I wore it. When I used the thumb snap, my handguns never fell out of the holster, nor even came close to doing so. But, you must adapt to and practice using the thumb snap. Generally, with soft holsters like this one you give up some retention vs. leather and kydex, but overall it is adequate. Remember each person’s body is unique and you should try it for your body style. Total Points: 90 points out of 100 possible = 90% = Recommended. I hope my process, this analysis, and review help you to identify your criteria and evaluate your individual factors to select the best holster for YOUR purpose, needs and priorities. Click here for more information and to order the Brave Response Holster. * This personal opinion article is meant for general information & educational purposes only and the author strongly recommends that you establish your own criteria based on your personal needs, goals, purpose, and priorities. It should not be relied upon as accurate for all shooters & the author assumes no responsibility for anyone’s use of the information and shall not be liable for any improper or incorrect use of the information or any damages or injuries incurred whatsoever.